← Cat jumping on bed and causing injury due to sharp claws! Who needs a cat window seat? Arles in France - Photo by kahala - the cat is called "Groucho"
December 2009: A cat window seat is the best present for your cat this Christmas. Why am I so confident? Well, I'm actually not that confident. But research by Purina says that it should be the most used item by a domestic cat. This, though, is not very scientific research but it is research nonetheless. And it seems to clash with other informal types of research. What do cats do all day when we are away? Sleep? Mine did. Or I thought she did. I know she did because I am home most days and she sleeps! There again she is old, so fair enough. The idea that cats do very little is supported by these two videos made by time lapse photography over 10 hours. They appear to show similar behaviour with not much going on. But Purina fitted webcams to fifty cat that took a photo every 15 minutes. This formed a kind of time lapse record as well and the results are different from the ones in the videos above. 777 photos were taken and studied. Total 69% (not sure what they did the rest of time ? sleep?) ? are these figures accurate and do we have them all? Jill Villarreal, an animal behaviour scientist who conducted the research on behalf of Purina says that cats do sleep from 8-16 hours daily but at other times are active. That statement conflicts with the figures disclosed (sleeping = 6% above, which is 1.44 hours in one day). The 12% of time socialising goes against peoples? idea that cats are solitary. This though is adaptation of domestic cats in my view. The conclusion that is drawn from this is that cats seek variety, Jill says. In other words they are bored - wrong? Jill also says that cats are seeing a world full of excitement. I am not sure this is true. I think that a domestic cat's world is much easier than a wild cat's world and a wild cat's world is one that is genuinely exciting but "exciting" is the wrong word; lets say more challenging but as a result stimulating and more dangerous. This develops better reasoning powers (the reason why wild cat hybrids are more intelligent). A cat window seat is good for a cat because it can watch the outside world safely and be stimulated. So I am going to by my boy cat, Charlie, a cat window seat and see if he uses it. Another failed project! Also interesting is the fact that playing occupies a small part of the day at 5%. Playing is recommended to help provide a more stimulating environment. But it appears it is not happening one way or another. Yes, doesn't he look like he owns me and the world sitting there? You'd expect a roar of a lion out of him. I'd love to get a video of him trotting towards me, as his feet are so big, he throws them side to side when he walks. It's quite funny. Aren't we lucky to know and care for these little loves. The more I get to know him the more I am amazed. Thanks for noticing his picture. And yes, Snow White is quite pleased with her self too. What else can she be, when I tell her 15 times a day what a wonderful cat she is. She's not as ladylike as she looks on the photos. Her coat colour endows that serious look with her, but actually she's a real funny cat, who enjoys playing and clowning around. Yes Michael it would make a good blog. We actually have a CD called Animal Healing which is music and sounds supposed to soothe anxious animals.But other favourite CDs of mine such as Timeless Sea(which is classical mucsic with the sounds of the sea) and my Taize CDs work equally well. Walter suffers from anxiety at stressful times such as bereavements of which we've had quite a few in his lifetime,losing people and pets. Quiet or classical music has calmed him at those times .We also played Reiki CDs which he likes as that is gentle repetative music. Both our cats like our singing as long as we don't hit any high notes ha ha. Another thing I found about singing to cats, when we were involved in feral rescue for Cats Protection, one day I had to wait for a lift back with a mother feral cat, Babz had taken her kittens in the CP van to safety as we didn't expect to be able to catch the mother so quickly but we had to get them away from a person threatening to poison them as they were in his garden. Babz had just gone and the mother went into the trap cage, of course she was frantic,worried about her babies, scared for herself.So I took her to a quiet spot and sat and sang quietly to her while we waited, she calmed down beautifully !!! I'm not that good a singer, so it must be that singing does somehow calm cats !! Ruth, you might know what kind of songs cats like and why. It can go further. What kind of music do cats like? I can see a article coming up here! It is soothing and friendly it seems. Soothing, friendly voices help to calm cats too. Actually, now I think about it, even I sing to my cat sometimes (rarely). It is a kind of lullaby to sooth and calm. Is calm music in a house, played softly a useful idea to calm a cat's environment, I wonder? 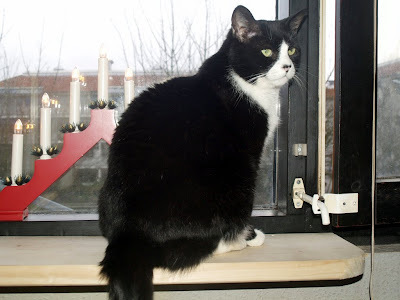 We have wide windowsills upstairs and downstairs too,our cats love to sit on them and watch out if it's bad weather. Cats love you to sing to them too,I often sing to ours and to next doors too if we are looking after them for our friend/neighbour. We used to have a robin come every Winter and he'd sit on the fence and sing with me as I put the bird's food out, but he didn't come last year. This year a blackbird has taken his place ! They are very 'cat wise' birds around here as we have lots of cats in our neighbourhood but it's very rare one gets caught. Hi Merrily, I like your comment and the idea of a cat enjoying being spoken to. I do it a lot myself. I think cats like the sound of your voice. It obviously portrays friendliness and a cat will then attach the sound to friendliness and come over. And they do talk back sometimes. My boy, Charlie, is quite vocal. And there is an actual conversation going on that I can understand....meowww. Faith has a Tea Table at the window, with a comfy Leopard throw to lay on, she watches stray cats, and birds, and leaves passing by. She and I have great conversations, I talk to her, and she replies. Funny thing, when I started feeding the neighborhood cats I doubt anyone had ever spoken to them. At first I just put food out for them, they would come by to eat and then leave. One summer day I spoke to one of the boys, and he stopped, and listened. I discovered that they really enjoy having someone talk to them, and now when I am in the garden, they come running, not for food, but to talk. Because they have enjoyed our talks, they let me scratch their ears, no doubt a first for them as well. I am sure there are millions of bored cats living uneventful lives, but not my cats, or my neighborhood cats, they are all happy cats, and that makes me happy. Here is Bigfoot. He loves this particular window because it is up high. He loves watching the birds and the frost melt on the trees. Bigfoot likes to go outside but only for short stints. He checks frequently that the door is still opened for him. It will always be opened for him, just as my heart to his sweet self. It is hard to believe he was a homeless cat. Finn, Snow White looks quite pleased with herself as well. Snow White looks very pretty in the photo. Thanks for a nice comment - very useful. I'll make it a project to get a cat window seat up for Christmas. The cats' Christmas present. Hi Michael. Our cats very much enjoy just sitting in the window looking out at whatever goes on, so I really think your Charley would enjoy having a seat too. A cat seat doesn't have to be anything fancy or expensive. Cats don't care much about design - the simple solutions will do just as well. If you have a low cabinet, maybe it can be placed below the window with the cat's favourite pad on it. Or just put up any old shelf you have - it will do nicely as long as it's big enough and doesn't rock too much. Snow White on cat window seat, looking terribly demure and ladylike. Actually sight only covers some of the news for her. The window also has to be opened to smell everything. So the hatches have been changed to a type that are both burglar and cat proof. I think you are spot on right, Ruth. The trouble is that the mentality people to insist that a cat must be indoors all time and no exceptions is deep rooted with little or no room for compromise or discussion. This is a fundamental issue, as you say, and is part of the very basis of our relationship with cats. I find it very sad to be honest. The outdoors has potential danger yes but I think we have an obligation to make a cat's life as interesting as possible while being as safe as possible. I get criticised a lot too Michael ! Some USA people even go so far as to say cats don't want to go out !That they are domesticated animals that don't need to go out. They totally ignore the fact that they are still wild animals at heart, that over the years we have denied them more and more of their natural lives and yes, as you say, made the world a dangerous polluted place for them. Yet there are often questions 'How do I stop my cat from trying to escape' The frightening thing too is the answers, all sorts of punishments suggested to keep the cat away from the door to freedom ! It sometimes seems they think it's compulsory to have a cat, therefore it must be declawed and it must sit quietly like some sort of a soft toy to be 'played with' when it's convenient. It's the must have as a possession mentality which is wrong ! As I said,I do understand in some circumstances cats can't be allowed out,but they do need some quality of life or it's very unfair to keep them. Ruth, I completely agree with you. It is a shame that cats often live half a life it seems to me. I have been criticised by an American for suggesting that cats should be let out under supervision. Or criticised for suggesting that we are partly responsible for created a hostile world for cats. I am thinking of traffic and poisonings by nasty people. In America it is the done thing to keep them in permanently. I think this can sometimes lead to behavioral problems caused by stress unless there is a lot o distracting input from us, which is, it seems to me, rarely available one way and another. Very interesting Michael.In my opinion the 'cats sleep two thirds of their lives' theory which most people quote, gives a totally wrong impression of cats needs, as people get them thinking they are there to pay attention to, only when it suits them. Cats do sleep a lot but only when they've nothing else to do. The sad part is that in the present world many cats get no outside stimulation as it's too dangerous to let them out in some places.Compare a cat used to having his freedom with a cat never allowed outside, the cat with freedom lives life as cats should and as they did before there was so much traffic and other dangers. To me it's similar to the way children have to live nowadays, yes there was always danger outside but as the world advances and there are more and more dangers and bad people around,children can't have the freedom they used to. Like cats, they adjust, but I do feel they are missing out on life a lot.One of our cats, sitting on the garden fence in the sun,stretching up a tree to strop his claws(which never have to be clipped) eating grass, chasing mice and birds,in comparison with one of the cats next door to us (one of 15)who never get out. The cat next door watches longingly through the bars of the run for a while then gives up and goes off to find a place to sleep. The cat with freedom comes in fresh and sweet smelling of Nature and telling us his adventures.In an ideal world all cats should have this life. Cats kept indoors need lots of attention, fun and games too. In bad weather when ours don't go out much they need this from us and they get it of course.They do sit and look out of the window if we are busy or going out but soon go off to find somewhere to sleep the time away.I know because I've popped back sometimes shortly after setting off and by then they've settled. I think cats need human company more than anyone thinks they do. It makes me sad to read of cats with nothing to do but sleep.